Early in his magical career Mr. Elmsley became interested in the slip cut, and particularly the variety that was done in the hands. Being unsatisfied with then existing methods, he set out to develop a slip cut more suited to his style of handling. Nate Leipzig's twirl cut, also called the swivel or the spin cut (ref. Dai Vernon's 'lYibute to Nate Leipzig, pp. 170-171), was a favored flourish in the Elmsley repertoire; so it was natural that he would consider combining the actions of the swivel cut with a slip cut. The resulting marriage of ideas produced an elegant and practical method. With the palm-down right hand, grasp the deck by its ends from above. The second finger should rest approximately half an inch to the right of the outer left corner of the pack, with the third and fourth fingers lying alongside. The outer phalanx of the thumb rests across the right half of the inner end of the deck; and the tip of the forefinger contacts the top card near the outer left corner. Preparatory to the cut, the right forefinger pushes forward on the top card, forcing it to pivot around the second finger. Move this card only slightly, angling the inner left corner off the pack for less than an eighth of an inch (Figure 71). upper half of the deck a bit. 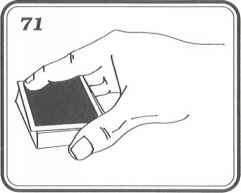 Without hesitation, pivot the inner end of the top half to the left and forward, while with the right forefinger you apply gentle pressure to hold back the top card (Figure 72). Continue to pivot the top half of the deck outward and around the right second finger, until this packet has turned a full hundred and eighty degrees. 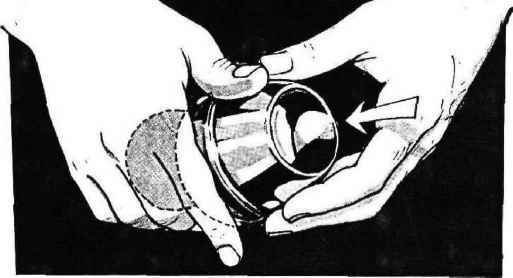 At this point the top portion will be completely disengaged from the deck, and lies trapped between the left forefinger and right second finger, suspended above the left palm (Figure 73). The top card of the deck, which has been held back, falls naturally onto the bottom portion. Release pressure on the ends of the packet, allowing it to drop neatly into the left hand. Then complete the cut by slipping the left hand's packet smoothly over the portion in the right hand. To help disguise the nature of the cut, tip the outer end of the deck downward and turn a bit to your left. If executed in a practiced and spritely manner, this sleight can be most deceptive.